Thanksgiving is just a week away. Of course we all know the story of how the Pilgrims and the Native Americans gathered at the Plymouth Colony (also spelled Plimoth) in 1621 to share a meal and give thanks for a bountiful harvest. However, did you know that the first official Thanksgiving in the U.S. was held two centuries later? That’s just one of the many little known facts about one of the most popular holidays in the United States. With the day almost here, we take a look at some other insights into Thanksgiving that you may have never heard. Actually, the “first” Thanksgiving was described in a letter written by Edward Winslow, the leader of the Plymouth colony in 1621. Unfortunately that letter was lost and was only rediscovered in the 1800s. It wasn’t until a Boston publisher named Alexander Young printed Winslow’s brief account of the 1621 feast and dubbed it the “First Thanksgiving” that the seeds of the holiday we know today were planted. That was in 1841. According to National Geographic, from there the concept of Thanksgiving Day caught on — so much so that President Abraham Lincoln declared it a national holiday in 1863. It wasn’t until 1941 that Franklin Roosevelt established the fourth Thursday of November as the official day of observation. In an ironic footnote, historians say that Thanksgiving was actually a day of fasting in the 17th century. What would Thanksgiving be without turkey? Actually, there is no proof that turkey was served at all during the first Thanksgiving. Historians know that the Indians provided five deer for the feast and that the pilgrims provided fowl they had shot. However, the fowl could just as easily have been geese or ducks. 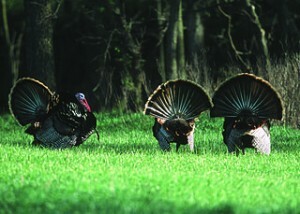 We do know that wild turkeys are no easy target. They can run 10 to 20 miles per hour and can fly in bursts of 55 miles per hour. In contrast, their domesticated cousins can’t fly at all. Also, one can hardly imagine a Thanksgiving dinner today without mashed potatoes or sweet potatoes, but apparently, the pilgrims couldn’t imagine a dinner with them. In the 1600’s, potatoes and sweet potatoes weren’t staples of the English diet. Are you tired after your Thanksgiving meal? Don’t blame your food coma on the turkey. Scientists say that tryptophan in most turkeys is not responsible for drowsiness. More than likely, alcohol consumption, a large intake of calories, or just plain relaxation is probably more responsible for your post-turkey snooze than the turkey itself. In 2012, it was estimated that 254 million turkeys were raised for slaughter in the United States. In 2011, some 46 million turkeys ended up on Thanksgiving dinner plates, which translated into 736 million pounds of turkey meat. Last year, some 43.6 million Americans drove more than 50 miles from home for Thanksgiving. Another 3.14 million travelers flew to their destinations. Regardless of where you go, or however you get there — or whether you are chasing a speeding wild turkey — SLS Consulting wishes you a safe trip and a happy Thanksgiving.